True movie lovers know that there aren’t many things more thrilling than visiting the very locations where your favorite movies were shot. Call it cinematic tourism or just giving your movie experiences a brand new layer; either way, it can be a fun and interesting way to enhance both your movie experiences and your vacation. A new smartphone app called AR Cinema will use the power of GPS along with augmented reality to actually bring you into your favorite films. Visit a street corner or landmark where a movie was filmed, hold up your smartphone and the app will show you the scene(s) shot there. The demo video shows films set in London, but the developers want to add additional cities. 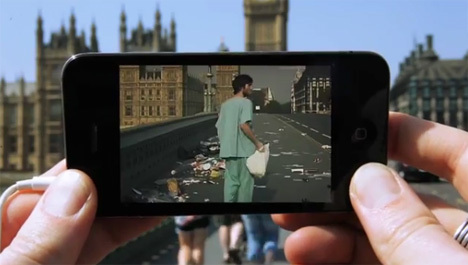 Of course, the people who live in those cities might not be thrilled with the cinema tourists holding up their phones in the middle of the street to watch movie clips, but this awesome idea could add a whole new layer to the tourism trade in cities like London, New York, Toronto and other frequently-used shooting locations. As an artist, what is your role in shaping technology? It’s a very modest one. Each new technology generates novel information and unexpected images of the body and the world, which often destabilises our paradigms of what a body is and how it operates. Technology generates uncertainty, it constructs the unexpected. That’s what makes it exciting to incorporate as part of artistic expression. What is it about the boundaries of the body that fascinates you? All of my projects explore alternate anatomical architectures – a body with a third hand, or an extra ear, or an artwork inside a bodily space instead of a public space. We are biological bodies, but we are often accelerated, augmented and enhanced by technology. There may be a time soon when bodies become portals of sensory experience. I might be able to see with your eyes when you are in New York, for example, or listen with someone’s ears from London. We can no longer think of the body as simplistically bound by its skin and containing a single self. Will it become harder to tell where we end and technology begins? That’s beginning to be the case. In 1000 years’ time, perhaps technology will be invisible because it will be inside our bodies. We will be able to recolonise the human body with micromachines, nanosensors and nanobots that augment our bacterial and viral population. Will the body become obsolete? I think that the body is obsolete. From the standpoint that it’s increasingly inadequate to cope with the technological terrain it inhabits. That doesn’t mean we can do without a body; there has to be some kind of embodiment. But I think the possibilities are there for unexpected hybrids of biology, technology and computer code. We are very much a meat, metal and software system now. Do you worry that your work combining technology and the body might jeopardise your health? There’s been no deliberate attempt to endanger the body, but to do anything physically difficult or technically complicated, yes, those actions might be risky. You do things with a positive attitude and a sense that you need to do this if you are to achieve anything. Is physical discomfort part of exploring the body’s boundaries? Only in a very general sense. If you are going to suspend your body with 18 hooks in the skin, and you are going to be hoisted 60 metres high by a large crane, there may be all sorts of possible problems. You anticipate those and try to take appropriate precautions. Those performances were not done to have a painful experience. Why do you have an ear on your left arm? At the moment this is only a relief of an ear. It’s partly surgically constructed and partly cell grown. We need to surgically lift the helix to create an ear flap, and then we will grow a soft earlobe using my adult stem cells. When the ear is more of a three dimensional structure we will reinsert the microphone and connect it to a wireless transmitter. Then any Wi-Fi hotspot will internet-enable the ear. We are replicating a bodily structure, relocating and then rewiring it for additional capabilities.